A few weeks ago The Little Sister was peering at the bookshelves with a curious look on her face, "Mom, what are all those books? Those yellow and black ones?" The Mom responded without thinking, "those are Dummies books." I wish we had a photo of her face at that moment: a mix of giggles and wisdom trying to work out in her head how there could be dummy books. The Mom went on to explain, ""Dummies Books" are written by people who are experts in their field to help other people understand the subject." We own several Dummies Books. 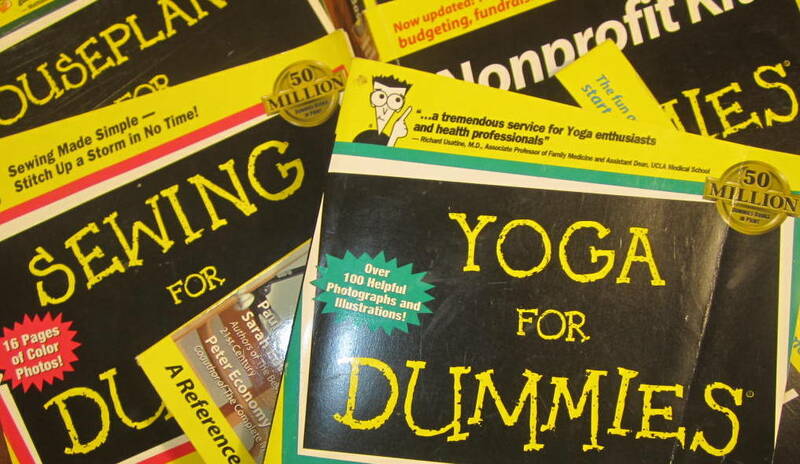 We frequents library book sales and always looks for the yellow and black covers: Sewing for Dummies, Yoga for Dummies, Nonprofit Kit for Dummies, Houseplants for Dummies. There is something comforting about referring to a Dummies Book for help. Mortgages for Dummies helped us navigate buying our first house. Houseplants for Dummies helped The Mom stop killing plants. Yoga for Dummies, got The Mom over her fear of yoga, there was something about relaxing in a room full of people just didn't work in her head. Rminiscing about our Dummies Books got The Sisters and The Mom into full BFWP brainstorming mode, there seemed to be a challenge here. The Big Sister got it, "we can invite readers to tell us what THEY are experts on, what Dummies book THEY could write!" The Mom asked The Sisters what Dummies Book they could author, wondered about what subject they were experts on, and without hesitation they answered (read the comments to find out). Here is your Challenge: We all have some special thing, a talent, a secret hobby, a career, a sport, a trick, something we are experts on. Don't worry you do not have to actually write the book, just tell us in the comment below what Dummies book Y-O-U could write! and find a Dummies book at a library near you! *Updated, originally published March 2011. Roux Making for Dummies --I can make a mean white sauce and dozens of variations on the theme --no recipe needed. My, it is fun to toot your own horn! A book for those of us who have absolutely NO idea about what is in their abdomen: Tummies for Dummies! Wait. How about one on how to make little gelatin animal candies: Gummies for Dummies! Or one on residents of ancient sarcophagi: Mummies for Dummies? If it were possible, "How to READ Poetry for Dummies". Mr Daniels-you have the wit of my father, which is cherished, but garnished with much eye-rolling. I would probably write "Manga and Graphic Novels for Dummies" or "Gathering Ginger Cat Hair on your Clothes for Dummies". I'm a master at that! Apparently I had no skills until then. Big Sister...I really need your list to pass on! Anxiously awaiting. Happy First Anniversary, The Four of Us (plus dog)and all the readers & commenters too! My Life for Dummies (is MY book, ha! ), a work in progress, procreation, process, prayer, protest, promise, problems, presence, but most of all providence! Right now, I am working on the chapter on Retirement! Like the Librarian, wondering about “Big Sistering”! The Big Sister's post is coming tomorrow! She voted to use it as our Anniversary post... perfect! These comments are wonderful, makes us think of other books we could write! "Giving a darn for Dummies" is my pitch. Step by step instructions on how to be mindful of all of the little things in life... Personal, Professional. Sending handwritten thank you notes, remembering birthdays, attending the meaningful events that tickle the fancy of our inner activist... Lists of the simplest ways of making life matter MORE for self & others involved with the self. Ten years ago, I think I might have believed I could have written the book on "Big Sister-ing" but today, I can admit that I learn more from The Big Sister, at her young, young age of 10, than ever have I ever known before. She's helping me become a better big sister. Thank you Books For Walls Project!! Happy Anniversary!! Crawling in crawl spaces for dummies. How not to get your hair tangled in splintered wooden floor boards. The no dirt down the pants belly crawl. How to hold a flashlight with with your chin and collar bone. LEARN from The ones with the scars and sore necks and knees.